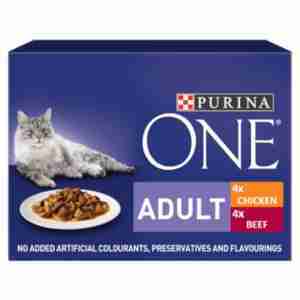 Purina ONE Adult Mini Fillets in Gravy is a delicious wet feed for cats aged 1 to 7. The fibres ensure your cat has a healthy digestive system. The high moisture content helps your cat increase her water intake and the high quality meat & fish is a healthy source of protein that helps support a healthy digestive system. The recommended daily amounts should be adjusted to weather conditions, your cat's level of activity and its physical condition. Serve at room temperature. Clean, fresh water should always be available. The website is easy to navigate and find what you want. Deliveries are consistent and reasonably priced, and above a certain amount you get it delivered for free. Sweet. Once there was a problem with our order, we phoned the company and the customer service was absolutely legendary. The lady, her name was Morgan, understood the issue within 3 seconds and devised a creative solution within 2 seconds. We were so happy.It's worth everything. This is what successful companies are made of. I ordered Purina Pouches and they arrived the next day. Always good service and much, much cheaper than supermarkets with free delivery. Since feeding my cat this, her coat has improved and she is more content. Great service from Pet Supermarket at a much cheaper price than a supermarket. Would highly recommend. I always buy Purina because since using it, my cat's coat is shiny and she is happy. I wouldn't buy from a supermarket any more as each box is about 60 pence cheaper from Pet Supermarket. I will always buy from Pet Supermarket now, as they are so much cheaper than supermarkets. The delivery is very fast and, even better, free! Using Purina, I can see a noticeable difference in my cats fur, and she loves the taste.